The following resources have been hand-picked to provide Product Owners with some of the better resources available to assist you in your role. These are also relevant to ScrumMasters in their capacity of being of service in helping a Product Owner to grow and be effective. Agile Product Ownership in a Nutshell (15:51) – an excellent summary of Scrum Product Ownership by Henrik Kniberg. We explore this and related material in-depth on Certified Scrum Product Owner (CSPO) courses. Passionate Product Ownership (online slides) – a Product Owner course with strong User Centric Design bent courtesy of Jeff Patton and Aaron Sanders. There is a lot of good content on Story Mapping in here. Making Humans a Multiplanetary Species – Elon Musk’s vision is not just about getting to Mars. Knowledge Navigator (5:33) – a long term vision from 1987. It’s interesting to consider the impact that this vision has had on smart phones, tablets and other technology that we use every day. A Day Made of Glass (5:32) and A Day Made of Glass 2 (5:58) – one of a series of envisioning pieces from Corning who make the ‘Gorilla Glass’ on iPhones. Stop-motion video of a Story map by Lachlan Heasman. The Neglected Practice of Iteration by Jeff Patton. A JIRA List Is Not A Scrum Product Backlog – good tips on how to get a big mess of issues into a quality product backlog. Cost of Delay. See the excellent Understanding Cost of Delay video (2:57) – This is a powerful technique for ordering Product Backlog Items and collections of such PBIs including themes and Epic Stories. This technique encourages us to establish an economic framework around our product development. Such an economic framework is discussed in Essential Scrum by Kenneth Rubin. To see how this can be used in practice at a portfolio management level, I recommend the paper Black Swan Farming using Cost of Delay (mobi or ePub download). Eisenhower Matrix – can be used to order Product Backlog Items in terms of Importance and Urgency. A simple general-purpose explanation can be found in this video narrated by British actor Alexander Perkins. Business Value Game – like Planning Poker but for value rather than effort. Innovation Games – there are dozens of ‘serious’ games described here and most of them have something to do with rapid qualitative market or stakeholder research in a manner that may be useful for Product Owners. Some of the most relevant ones include “Prune the Product Tree” for product road mapping and “Buy a Feature” for prioritisation. I am a trained Innovation Games Facilitator. If you give any of these a go at work, I’d be very interested in hearing about your experience. Success and Quality Sliders (PDF) – Success sliders, Quality sliders (slightly adapted from Rob Thomsett) plus a Trade-off Matrix. Velocity Range Calculator – Input a set of velocity data points to produce a forecast. Includes an explanation of the formula used. 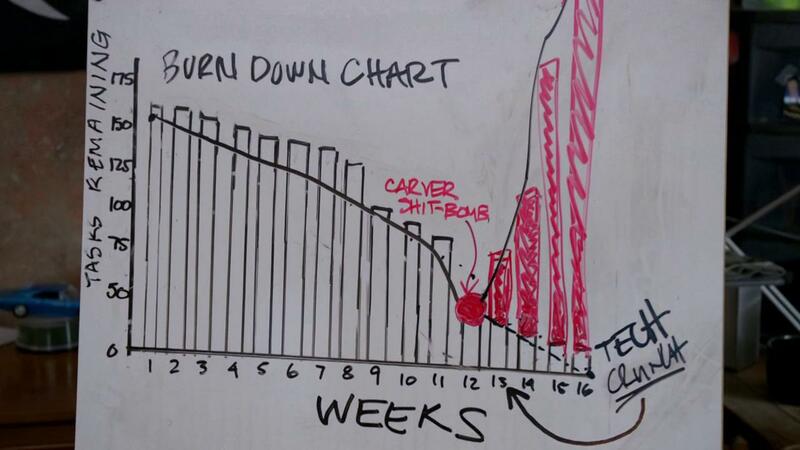 Scrum debuts on HBO’s Silicon Valley (work-friendly version 2:17) Also Pied Piper burndown chart.